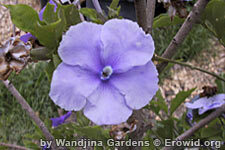 Brunfelsia are a small to medium sized tree which produces white and purple flowers. It has been used as an admixture in ayahuasca brews as well as having a reputation as an aphrodisiac. It has a history of medicinal use in S. America.